Been reflecting on this a lot too. It can be very easy to focus on the end, especially when the new beginning involves uncertainty. But I'm beginning to see that with the uncertainty comes possibility. The opportunity for something new. And though scary, it can turn into something worth while. I love this. New beginnings can be so very hard, even when they have promise all their own, it can be hard to see that through the pain of the end. This reminds me of one of my favorite quotes: "New beginnings are often disguised as painful endings..." - Lao Tzu. I just love this post. That's a great way of looking at it and very well-written. It helps to keep these words in mind. For a few years I felt like I had reached the end, I felt like I'd fast-forwarded to old age because I had no new chapters beginning / no fresh things happening etc; thankfully that's fading now. Yes! Thank you for reminding me of it. It is so true. The first time I read the word "transition" in this context, it helped me immensely. It expanded my horizon when I felt a bit stuck. I read this on Monday and meant to come back and comment.... What a week! 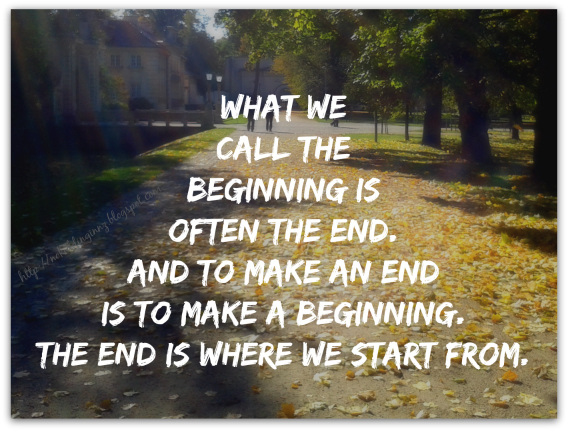 There was a popular song when I was in high school, Closing Time by a one hit wonder band called SemiSonic, and part of the lyrics were "every new beginning comes from some other beginning's end." It's a phrase that I've held on to through many transitions throughout my life (I even emailed Cristy the same quote earlier this week in the context of her potential job change), but now I realize that this concept can be applied to this unchosen life too. I thought of that same song lyric. It really does change one's perspective.